Please scroll down and click on links to see more photos of trains in this series. I hope you enjoy these photos as much as I enjoyed taking them. 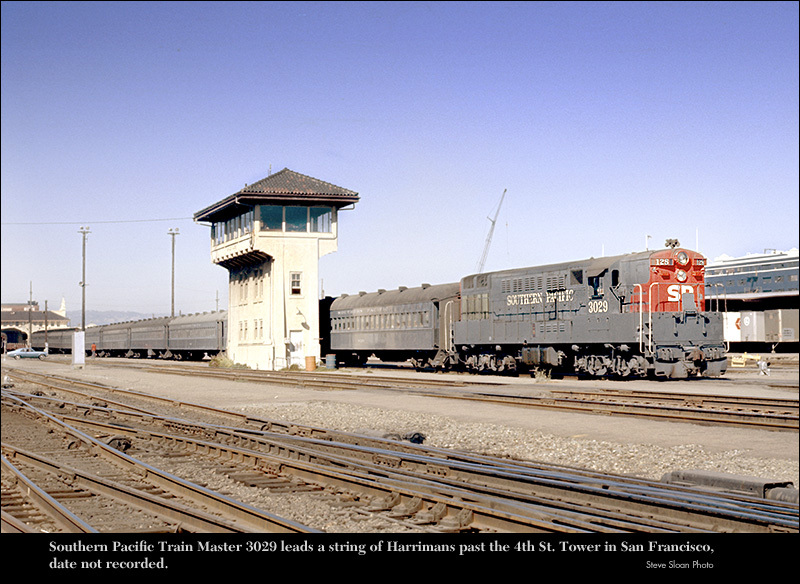 The Southern Pacific railroad will always be my favorite railroad! A little story: My dad was an SP hoghead (locomotive engineer). He hired out with SP in 1945. When he saw the Fairbanks Morse Train Master locomotive demonstrators touring the SP he said to the SP (management) officials there, "Oh God, last thing we need is another Trainmaster!" 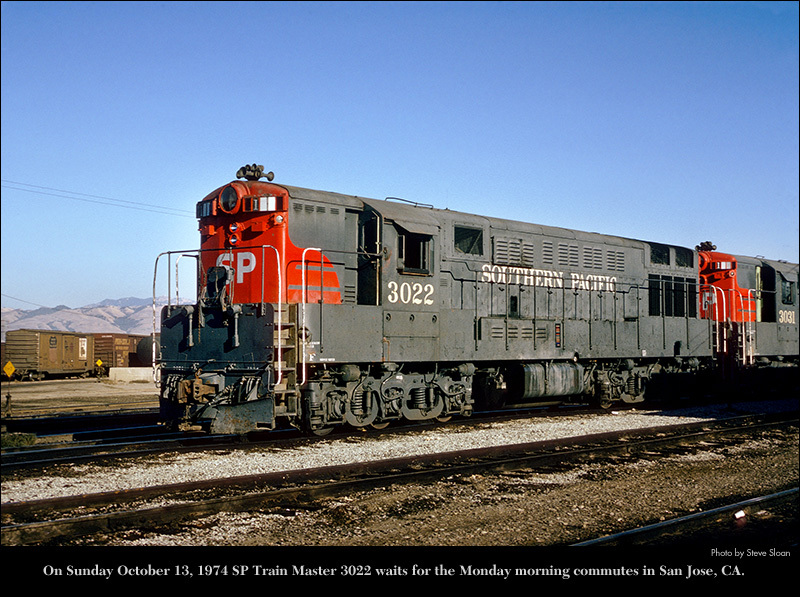 Reportedly (sources) SP 3020 was built as Fairbanks-Morse Train Master demonstrator TM-3 in 1953, construction number 24-L-732. It was purchased by SP in November 1953 and became SP 4800, class DF-500. In the 1965 renumbering it became SP 3020 class FP624-1. It was retired in June 1974 and sold in August 1974 to Chrome Crankshaft. 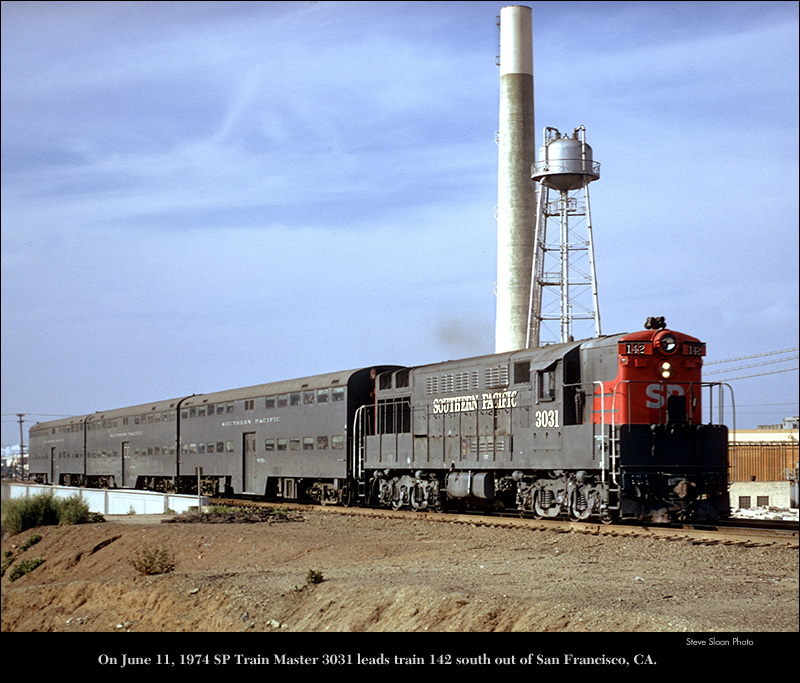 SP 3020 at 4th St.
Southern Pacific Fairbanks Morse H-24-66 Train Master 3020 leads train 132 past 4th St. Tower in San Francisco (date not recorded, 1974?.) 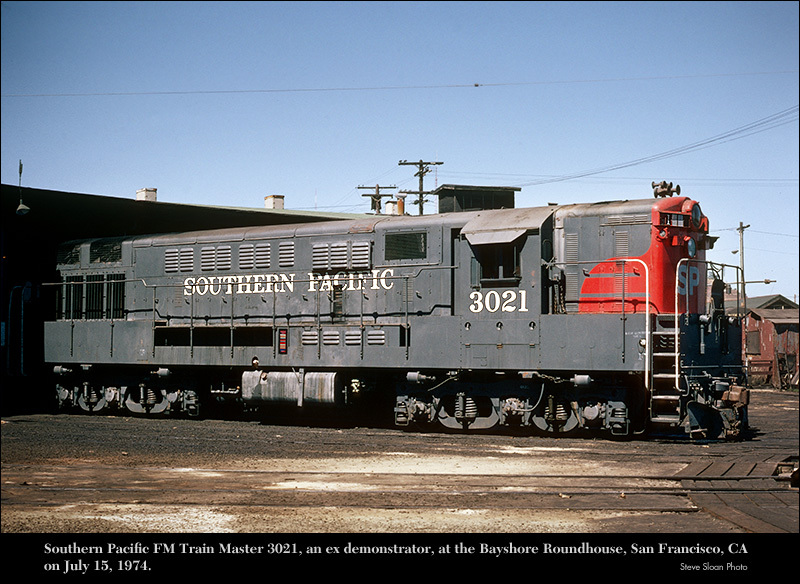 The SP 3020 was built as Fairbanks-Morse Train Master demonstrator TM-3. Reportedly (sources) SP 3021 was built as Fairbanks-Morse Train Master demonstrator TM-4 in 1953, construction number 24-L-733. It was purchased by SP in November 1953 and became SP 4801, class DF-500. In the 1965 renumbering it became SP 3021 class FP624-1. It was retired in December 1974 and sold in May 1975 to Chrome Crankshaft. 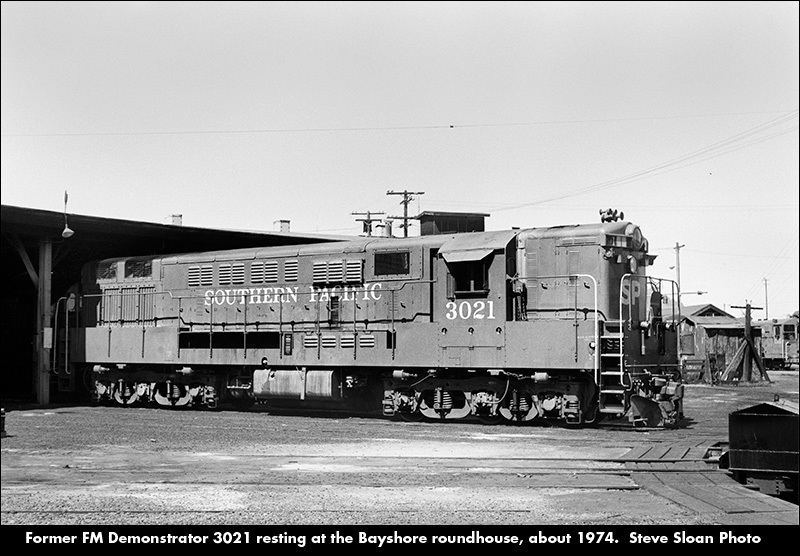 SP H-24-66 3021, an ex-Fairbanks Morse Train Master Demonstrator Locomotive, at the Bayshore Roundhouse on July 15, 1974. Former Bayshore yard photo location. 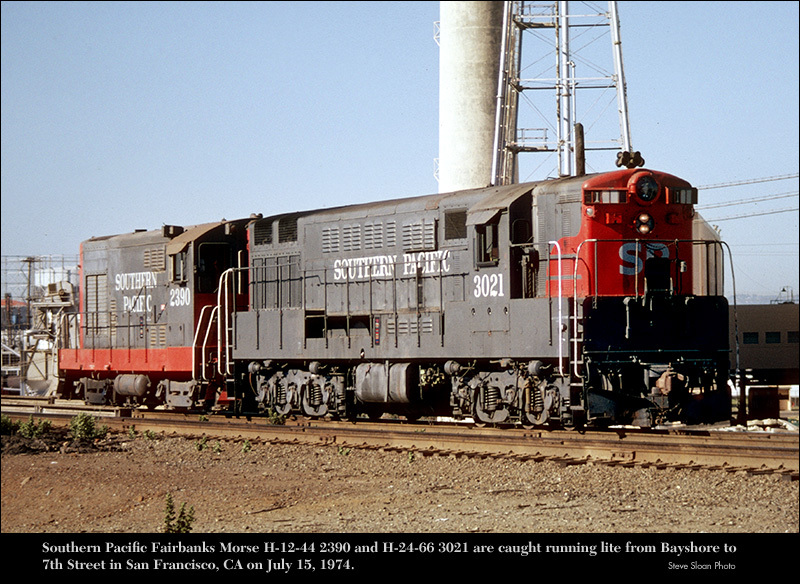 Southern Pacific Fairbanks Morse H-12-44 2390 and H-24-66 3021 are caught running lite from Bayshore to 7th Street in San Francisco, CA, near Quint and Jerrold, on July 15, 1974. Reportedly (sources) these were originally built for, and rejected by, the New York Central. 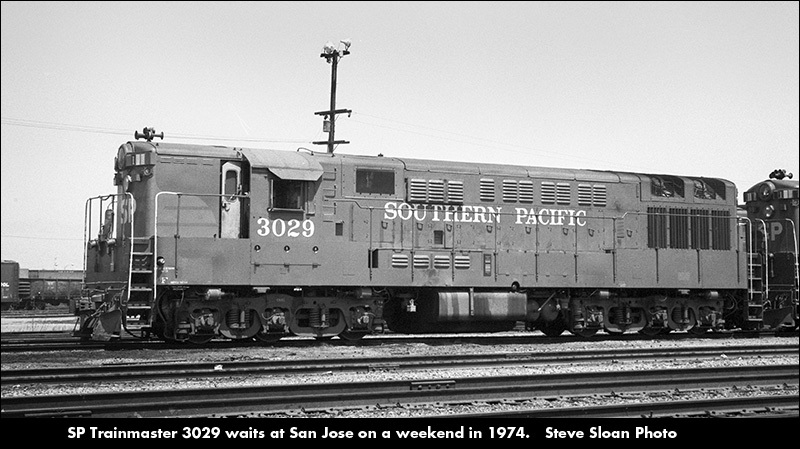 SP 3022 was intended to be NYC 4604 but was instead shipped to the SP in December 1953 as the 4802, Class DF-501. It was F–M construction number 24-L-791. In the 1965 renumbering it became SP 3022, Class FP624-2. In May 1975 it was sold to Chrome Crankshaft and was scrapped. SP 3022 at 7th St.
Photo of SP 3022 at 7th St. 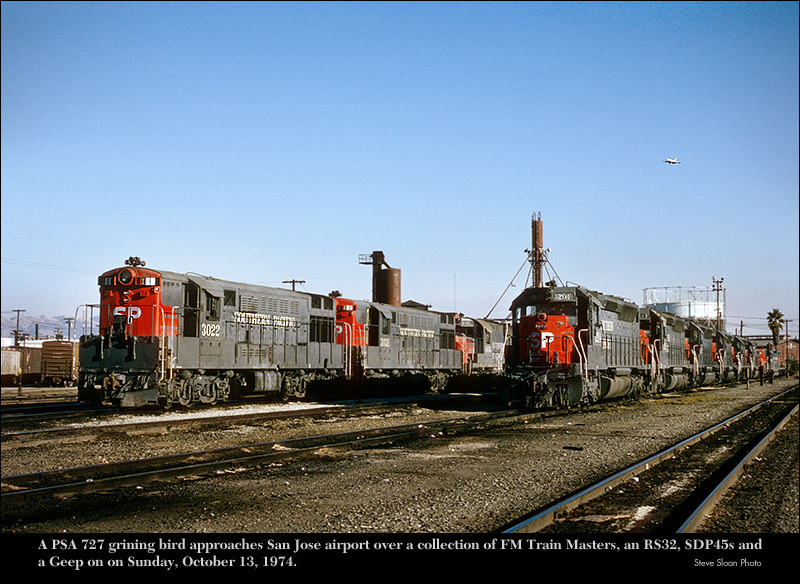 The World's Friendliest Airline and the Friendly Southern Pacific: A PSA 727 grining bird approaches San Jose airport over F–M Train Masters 3022 and 3031, RS32 4005, SDP45s (3204 & others) and a Geep on Sunday, October 13, 1974. SP Train Master 3022 waits for the Monday morning commutes in San Jose, CA. Reportedly (sources) these were originally built for, and rejected by, the New York Central. 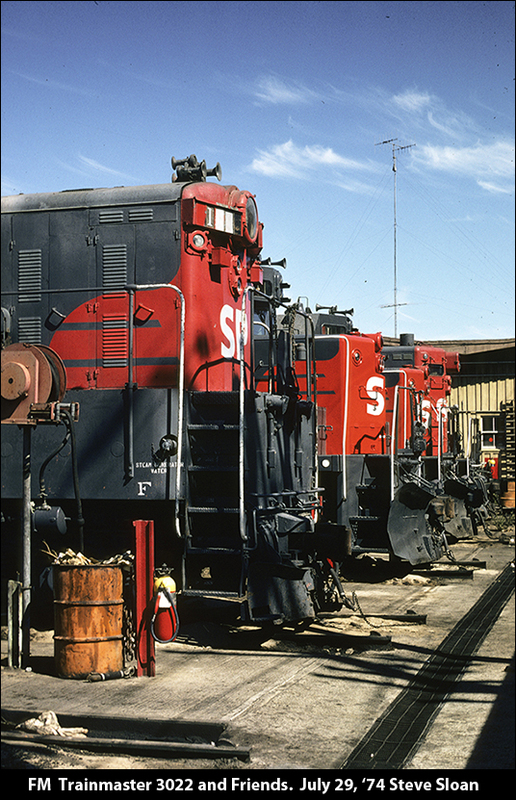 SP 3025 was intended to be NYC 4607 but was instead shipped to the SP in December 1953 as the 4805, Class DF-501. It was F–M construction number 24-L-794. In the 1965 renumbering it became SP 3025, Class FP624-2. In Dec. 1975 it assigned to become braking sled SPMW 9102, stripped but left incomplete. In Sep. 1978 it was scrapped in Sacramento. 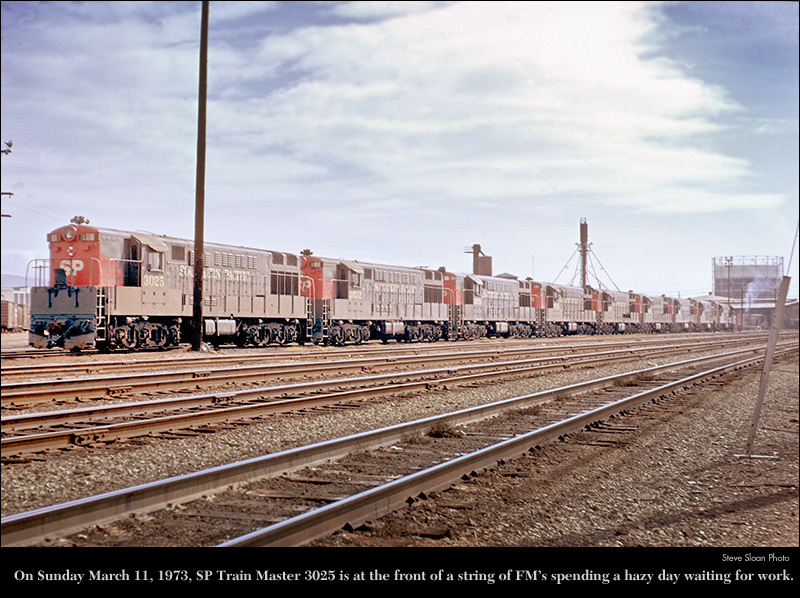 On Sunday March 11, 1973, SP Train Master 3025 is at the front of a string of F–M's spending a hazy day waiting for work. Reportedly (sources) SP 3028 was shipped in January 1954 as SP 4808, F-M construction number 24-L-805. After it's engine failed it was sent to West Colton in March 1974 for testing as a brake sled. In June 1975 it was scrapped in Long Beach. 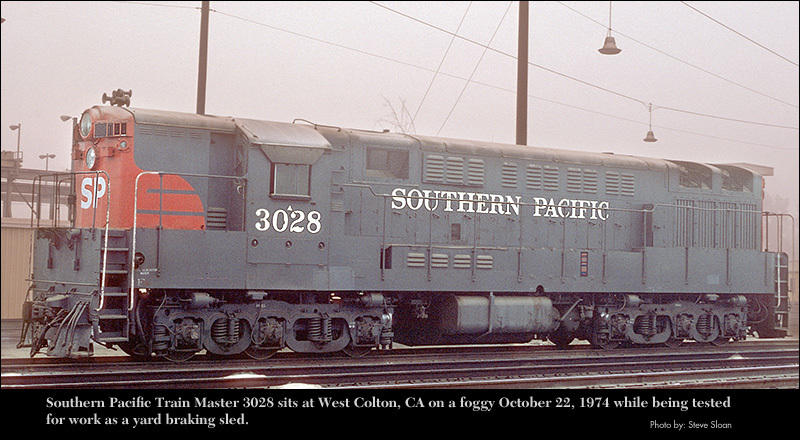 Southern Pacific Train Master 3028 sits at West Colton, CA on a foggy October 22, 1974 while being tested for work as a brake sled. Reportedly (sources) SP 3029 was shipped in January 1954 as SP 4809, F-M construction number 24-L-806. It was retired in June 1974 and scrapped in August 1974. This SP Trainmaster is hanging out (Date not recorded, 1974?) where most SP Train Masters did on weekends, at the power pool near Lenzen Street. Former San Jose Roundhouse photo location. 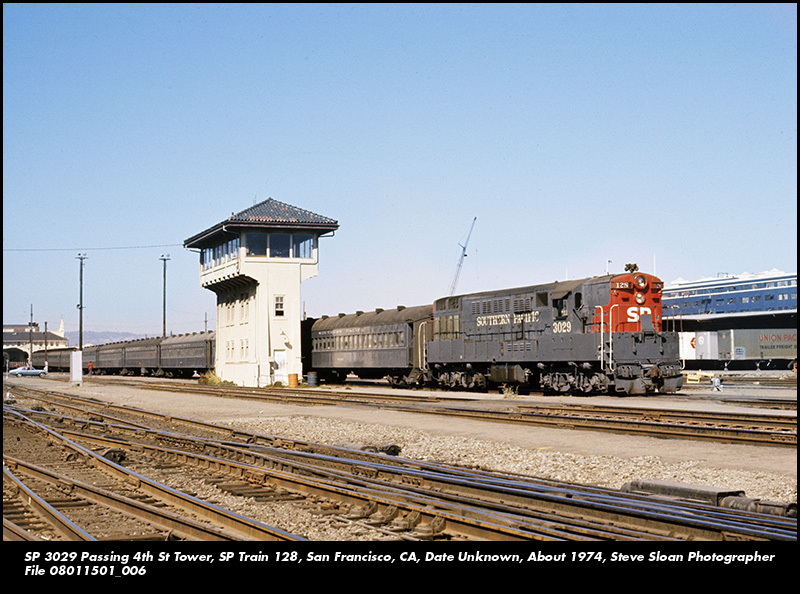 Southern Pacific Trainmaster 3029 on SP Commute Train 128 passing the 4th Street Tower, San Francisco, CA, (Date not recorded, 1974?) According to "Jim", "128 was a weekday limited-stop rush hour train leaving SF at 4:55. It wouldn't have any special consists or stops. The "Big Game" special was on a Saturday and had 12 cars in later years. I saw it with 12 galleries, or 1 harriman and 11 galleries. Extra galleries were added to some other weekend trains due to Stanford football games, but train 128 was strictly a weekday rush hour train. There is another set of harrimans on an adjacent track, that look like that last three cars of the first train. Train 128 ran with 6 harrimans from the 1960s until about 1975-76 when it was dropped to 5 harrimans. The longest string of harrimans I recall seeing, was 8, and that was only on certain holiday times when they added a couple to 122 (4:15pm departure) for people getting off work early. Of course, in the pre-late 1960s days there were longer strings of harrimans." Reportedly (sources) SP 3031 was built from NYC 4601 which was partially assembled before being rejected by the NYC. It was shipped in Feb 1954 as SP 4811, F-M construction number 24-L-788, SP Class DF-501. It was retired in Feb. 1975 and scrapped in May 1975. 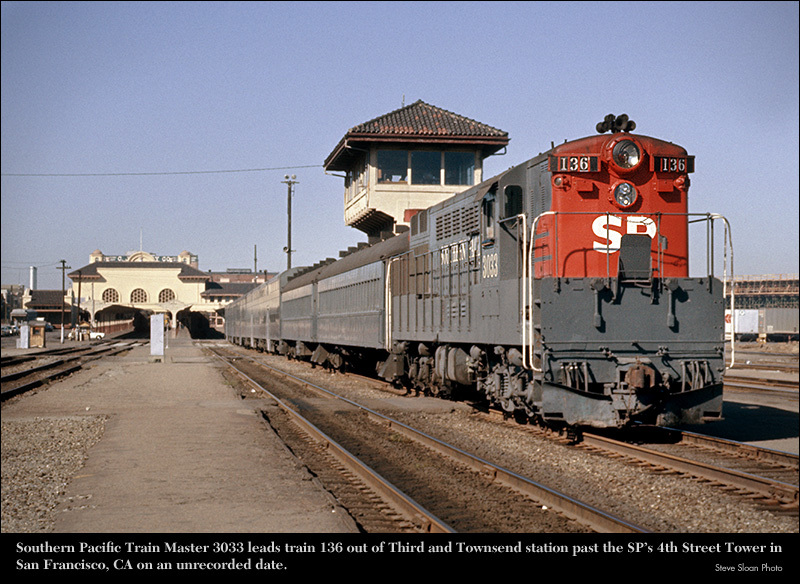 On June 11, 1974 Southern Pacific Train Master 3031 leads train 142 south out of San Francisco, CA. 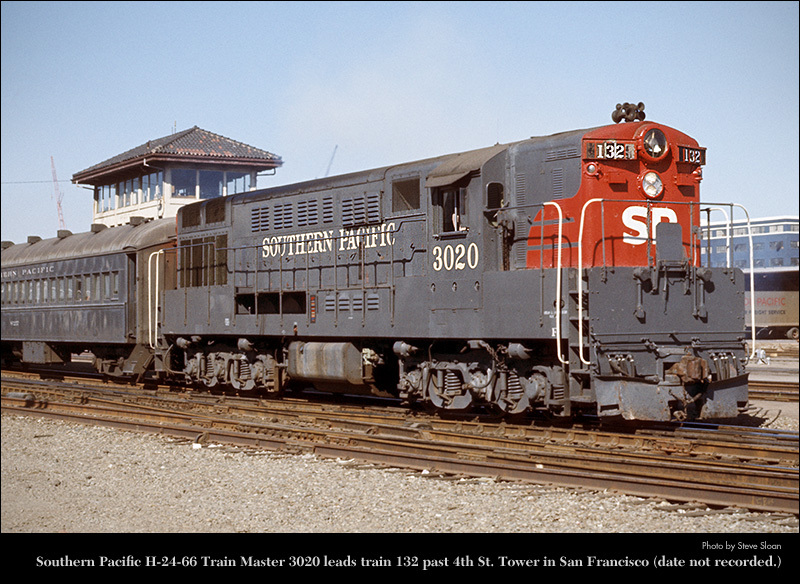 Southern Pacific Train Master 3033 leads train 136 out of Third and Townsend station past the SP's 4th Street Tower in San Francisco, (Date not recorded, 1974?). Notice the trainmaster's white hat on this F-M Train Master's horn. 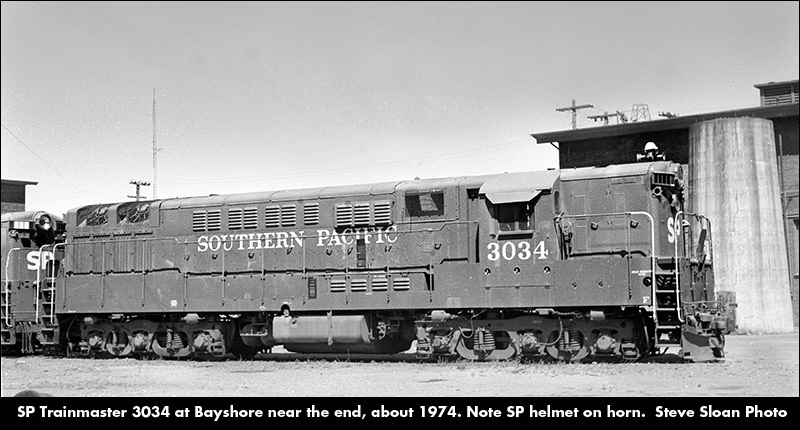 SP 3034 is sitting at Bayshore waiting for the end, (Date not recorded, 1974?). Former Bayshore yard photo location. To all the great folks who helped me out with information for these Web pages! It is appreciated if you do not repost or forward any photos I am posting to any other list, or online forum, or social network (like Facebook, Google+ or Flickr) without permission of the contributor or the photographer. All photos are copyright the photographer unless otherwise stated. I will always try as hard as I can to get the permission of the photographer when (and if) I post work by others. When I do I will try to honor their photographic style. Please do not produce or distribute altered versions of this work.